Ahh, bread. There’s a reason that we, and by “we” I mean almost the entirety of the human race, have been consuming bread in one form or another for centuries. It takes some of the most basic ingredients with generally long shelf lives and turns it into something not only palatable, but pleasurable. Why Do We Love Bread So Much? The main ingredient of most breads is a flour of some kind, and most types of flour contain carbohydrates, the macronutrient frequently referred to as carbs. They’re thought of as rather villainous in many modern diets, there’s a good reason why we have such a hard time giving them up. Carbs actually make us happy, so happy, in fact, that the majority of us are addicted to carbs. The carbohydrates found in almost all types of bread do a wonderful job of filling our bellies and providing a quick boost in energy levels. While more processed carbs found in white flour may not keep us full for as long as we’d like, whole grain wheat flour and other flours with lots of fiber do a great job of keeping us satisfied over a significant period of time. Bread is also fairly portable, which is part of why it was so widely utilized as a main food source in days gone by. Look at the popularity of sandwiches even today for a great example of this. More practical reasons aside, people like bread because there are so many different variations of it that there is a variety to suit almost every taste on the planet in every culture imaginable. 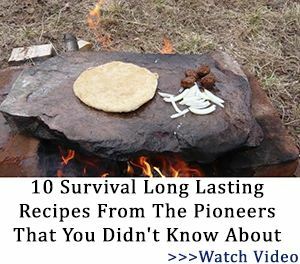 Is Bread Really a Good Survival Food Option? Absolutely! Making bread can pretty much be a simple or as complicated as you want it to be, and though there can be a bit of a learning curve for most people who don’t make their own bread on a daily or even yearly basis, anyone can make it. You can make it from ingredients that are easily stored, and though regular bread doesn’t have an inherently long shelf life, those separate components do. 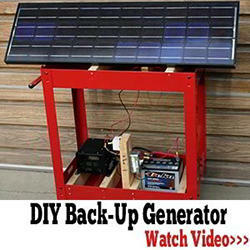 There’s also a lot of room for variation, allowing you to work with what you have. I’ll share with you a remarkably simple flat bread recipe that’s perfect for everyday and for survival situations. You may want to practice preparing this bread over an open flame before you need to, just like you hone the rest of your survival skills. I made up this batch over the stove for an afternoon snack for my kiddos, and they loved helping mix and roll out the dough. Seriously, those are all the ingredients this recipe requires. It’s very simple and it mixes up and cooks quickly. 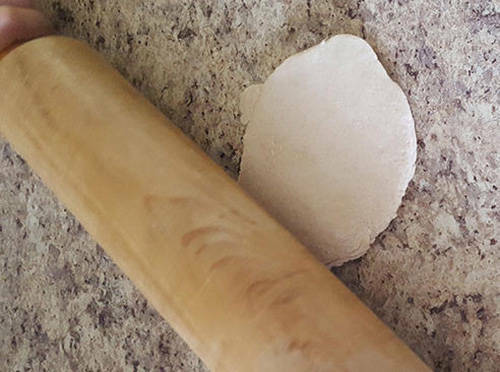 This bread is almost like tortillas, but with a little tougher texture. 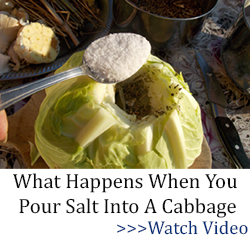 I suggest cooking them immediately before eating them as they tend to get tough when they’ve sat out for a while. Step 1: Put the flour and salt in the mixing bowl. Step 2: Add ¼ c of water. Mix it in thoroughly. 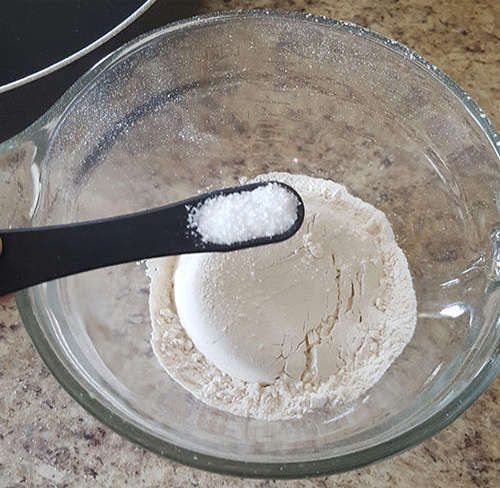 If all the flour mixture isn’t able to be incorporated into a sturdy dough, you may need to add a little more. Be sure you add water slowly so you don’t get too much. When the all the flour mixture is incorporated and the dough is not sticky and can form into a ball easily, you’re good to go. Step 3: Knead the dough for about five minutes. Step 4: Roll the dough into a ball and put it back in the mixing bowl to rest. Allow it to sit for about 15 minutes. 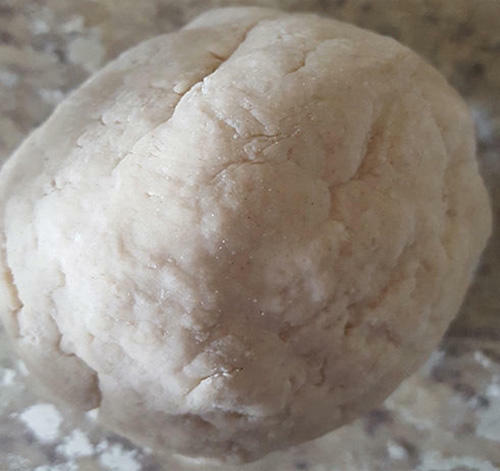 The kneading and resting processes help the dough become more elastic by setting the gluten in the dough up to form into long, stretchy chains of protein. Step 5: Split the rested dough into several lumps about the size of ping pong balls and roll them up neatly. 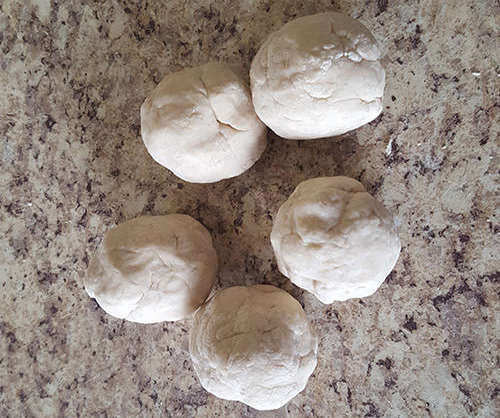 Step 6: Roll out each of the dough balls into a flat circle, as thin as you can get it. The dough will bounce back a bit and it won’t roll out quite as thin as you want it this time. 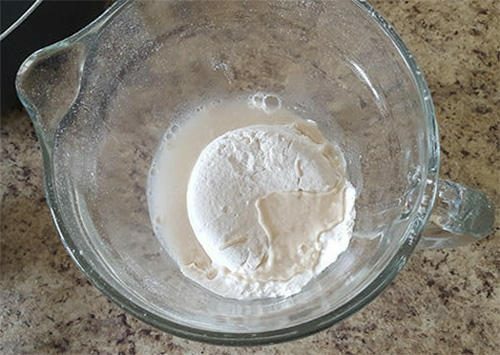 So long as it isn’t terribly humid, you don’t need to worry about flouring your work surface like you oftentimes do with dough; this dough is really not sticky at all and will peel right off countertops. 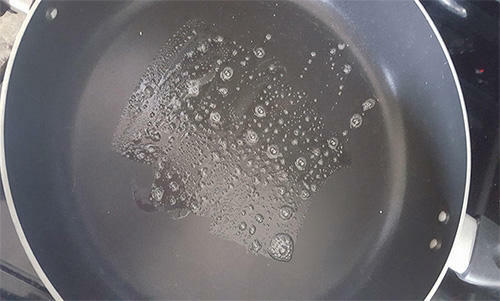 Step 7: Heat your skillet until a drop of water in it sizzles instantly. Step 8: Take one of the dough circles and roll it out as thin as you can get it again. The little rest after the first rolling allows the dough to be rolled even thinner. Step 9: Place the first dough circle in the pan. You can add a little oil to the pan if you’d like, but it’s not necessary. 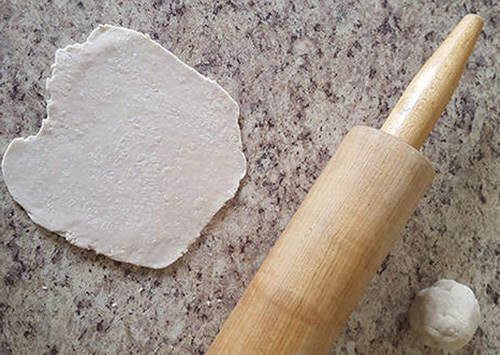 The flattened dough will immediately start to curl up around the edges. 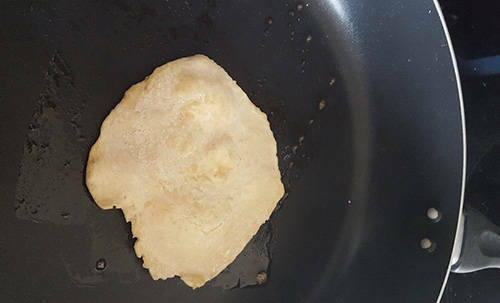 Step 10: Let the dough cook in the skillet until large bubbles begin to form, then flip it over to brown up the other side. Each piece of flat bread only needs to cook for a few minutes total. Step 11: Cook the rest of the flat breads the same way. This very basic flat bread is incredibly versatile. You can serve it as a part of main dish for breakfast, lunch, or dinner or with jam or honey for dessert. They’re perfect for serving up anything taco-style, whether it’s actual Mexican fare or any other food you’d like to have in a hand-held form. Do You Have the Ingredients for Emergency Survival Bread in Your Stores? While storing some traditional bread ingredients in your emergency stores isn’t very practical, this very basic survival bread recipe is easy to prepare for. You likely already store these ingredients in some form or another, and it takes very little time to prepare. 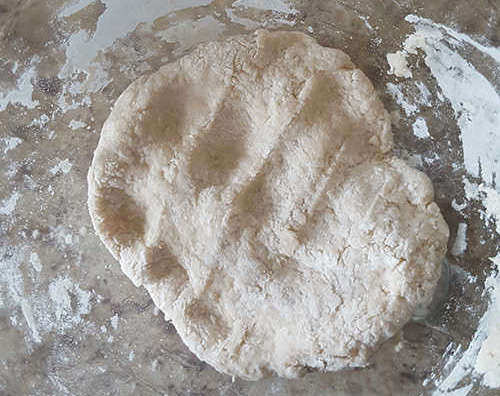 Learn how to make this simple flat bread to add a little versatility to your survival diet. When I was a youngster 70+ years ago this was called camp bread. The dough was prepared the same but was wrapped around a stick and then cooked over the fire like a marshmallow. I loved it, and my children did too when I showed it to them, so the art is not forgotten just laying around somewhere waiting to be remembered. I grew up eating these. 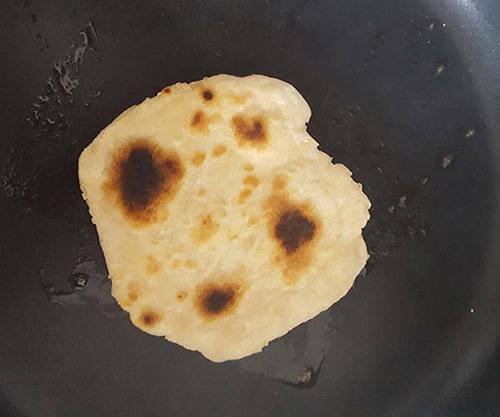 We called them ‘ho cake of bread’. That’s also basically the recipe for hard tack. Only hard tack is cooked in an oven instead of a frying pan. Also the recipe for stick bread where the dough is rolled into a long coil and wrapped around a stick to be cooked over an open fire. I am reading a book by Bernard DeVoto about the early migration to the left coast in the mid 1840s. One of the foods the emigrants took with them on their trek across the plains was dried bread. Without knowing that fact, I have been drying cut up bread crusts for some time now and storing them in plastic jars. Basically they are croutons without any flavoring added. They keep quite well in plastic jars. I’ll bet the emigrants would have willingly paid a good price for a stock of light weight, non-breakable, reusable,storage devices what would float in case the wagon upset while crossing a river or creek. This is just One recipe I found so I suggest doing a search and find ne that appeals to you or may have ingredients you may or may not have. Some may use oil…this one uses butter…. Some people add various fruits such as raisins or blue berries. AREPAS are usually made from corn flour and are not quite as thin. They’re shaped more like “English muffins”. Hey, guys. 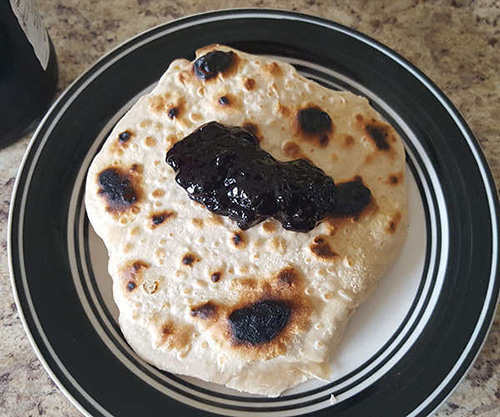 I tried to write some nice comments about flatbreads and bannock but for some reason this page doesn’t like me. Must be some kind of server glitch. I’ll give it a day and check back and try again. So many variations on a flatbread. And in an extended grid down situation bread might truly well turn out to be the staff of life. 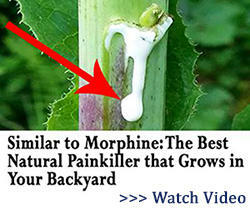 I think a filter has been installed on this website. I have noticed the same thing myself. Just occurred recently like in the last week or so. You may be right, Chuck. Just checked right now and both my comments came through. Just have to be a little more patient, I guess. Obviously ignore the 2nd comment. Armin, sometimes I have to refresh the page to see my comments. Seems every time FarceBook is in the process of making changes, glitches like these occur. I have noticed very recently if you have posted and try to post again, your post will be delayed. I haven’t tried to post after a long post. It may be some kind of metering program that only allows a certain amount of posting. It has occurred just within the last week. If you wait a while (length unknown) you can post again. You can also make a basic baking powder biscuit dough and drop by spoonsful onto boiling soup/stew. Dumplings will also thicken the stock while you’re cooking them so take that into account. 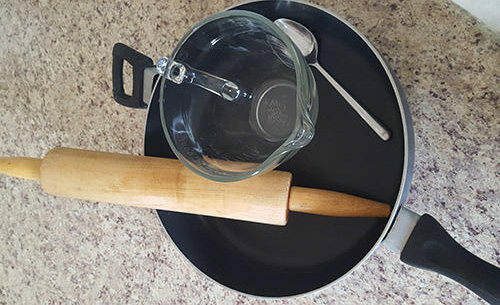 Make sure your lid fits well or they won’t steam properly. 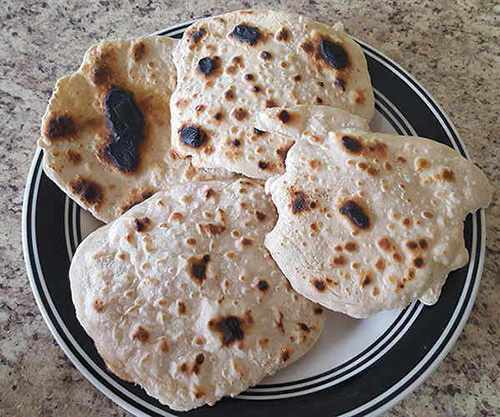 This flat bread is actually very good – I’ve made it several times. You’ve just reminded me about dumplings again, Miss Kitty. One of my favourite ways to use leftover mashed potatoes. Super simple to make. Mashed potatoes. Enough flour so that you end up with a dough instead of a potato mass. One or two eggs. Little salt. Nutmeg. Throw them into boiling water until they float. Scoop them out and eat them with whatever side you want. If you have leftover dumplings for the next day just cut them into slices and fry them. Waste nothing. I lived off this bread along with beans, banana, and papaya for a month during one of my tropical survival misadventures in the early 80’s, plan survival well enough that you never have to eat it on a regular basis, it gets tiresome after 2-3 days. I was ecstatic to return to Texas where I could get a chili dog and a Bud for $2 at a gas station! Eating the same thing every day always gets tiresome, but it’s a lot less tiresome than starving to death. Bread like this sure isn’t the most exciting thing you can eat but it has a lot of energy and that’s what you need in a SHTF situation. I have recently found dry canning that will extend the time rice, flour, beans, pasta for many years. It’s very simple, wash containers, glass jars, then place them up side down in an oven @ 250° and let them bake for 1 1/2 hours. Then take them out till the jars with beans and return them to the oven for another 1 1/2 hours. Place the kids on the jars as the jars come out of the oven. Beans will be good for 30, years. Cmon foilks!!! 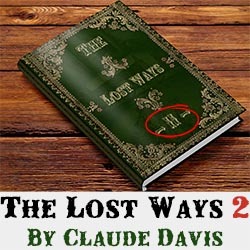 Most of us know claudes a fraud! This is nothing more than a money making venture. It goes the same for left coast chuck! Find another web site! This fool is just making money off you! West coast chuck is just another shill!!! I REALLY hope you folks don’t put your survival on this fool… or his supporters. They just RIP off info on real sites and claim it as their own! Do your due diligence folks! 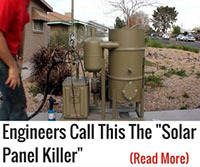 This rip-off will just get you killed on half baked theories The info is out there for NOTHING! CLAUDE IS A FRAUD!!! . But tell us how you REALLY feel, Sheepherder! Seriously though, what about bread triggered this? Or did it just show up on the wrong board? I’m afraid I must disagree. Yeah, Claude’s trying to make a buck, but so’s everyone else in this world. 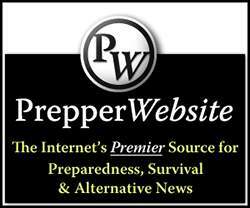 I find the content and the subscriber posts (usually ;)) enlightening and the hucksterism is nowhere NEAR as bad as most of the other survival sites. Most of them are one long infomercial with zero actual content – so frustrating! Keep up the good work, Claude!